D.C. Everest is committed to a culture of excellence by educating all students to be community, career and college ready to succeed in our diverse world. 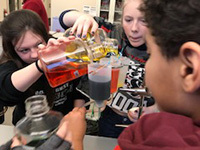 For the second year in a row, seventh grade students in DJ Huddleston’s class participated in the University of Wisconsin-Madison (UW-Madison) Bucky’s Classroom outreach program designed to increase college opportunities for all students by building college access knowledge and providing classroom resources around career exploration. 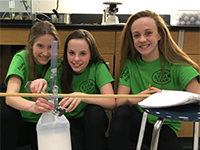 On March 7, three D.C. Everest (DCE) science instructors presented at the 2019 Wisconsin Society of Science Teachers (WSST) Convention in Madison, Wisconsin. WSST is the largest membership organization in Wisconsin focused on the advancement of science education. 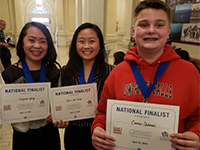 Each year, the U.S. Army Educational Outreach Program and the National Science Teachers Association host the eCYBERMISSION competition — a web-based science, technology, engineering, and mathematics (STEM) competition for students in 6th – 9th grades. Teams of students must formulate a question, define a challenge faced by their community and then construct explanations and design solutions for that problem.